We’re looking forward to receiving our new bus today! In the meantime, our construction crew has been hard at work setting up the drywall and building out classrooms. The Discovery Point Heritage center is looking spacious and has many windows, providing plenty of natural light for our children. Our sons love watching the construction process and are very excited to see everything coming together! 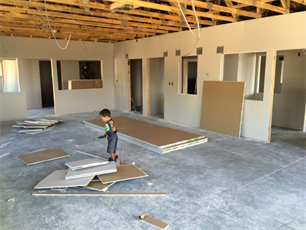 Here’s our youngest getting a sneak preview of what will become the early preschool classroom. We will have two classrooms optimized specifically for 2- and 3-year-olds. These specialized classrooms are tailored to children’s developmental needs and provide the perfect environment for age-appropriate challenges, learning experiences, and motivation to succeed. We can’t wait to share them with you and your family!